They’re creamy, decadent, and oh-so-heavy, but nevertheless, cheesecakes are the perfect people pleasers when dessert time comes along. To Arab palates, however, there is always the potential for sweet to turn sweeter. And there’s no better way to hit the mark than by fusing the Eastern treats of baklawa and kunafa with a traditional, Western cheesecake. We start with the base – my go-to cheesecake recipe. 1. Line and grease a spring-form cake pan. Preheat the oven to 170°C. 2. Blend the butter and biscuits (removing a few so that you’re using just under a full packet) to prepare the cheesecake base. Press the finely crumbed result into the pan to form a solid bottom layer. 3. In a clean blender, combine the cheeses and condensed milk. Beat one egg with a pinch of cinnamon or vanilla sugar, then add to the blender. Blend until the ingredients form a smooth, creamy mixture. 4. Pour the creamy layer over the prepared biscuit base in the cake pan. Once the cheesecake is ready for baking as per the above recipe, the next step is to choose a topping. Baklawa or kunafa: what’s your poison? 1. In a bowl, combine the crushed nuts, sultanas and sugar. This will form the baklawa’s filling. 2. Cut 10 sheets of Filo pastry to match the shape and size of your springform pan. Separate the sheets into two sets of five. 3. Place greaseproof paper on your workbench and, using a brush, carefully grease each sheet in the first set of Filo pastry with melted butter. Be warned: the sheets tear very easily, so you will need to start from the bottom and work your way to the top sheet, moving them as little as possible. 4. Carefully place these five greased sheets of Filo pastry on top of your raw cheesecake base. 5. Sprinkle your baklawa filling evenly over the pastry. 6. Repeat step three with the second set of pastry sheets. Make sure the top sheet in particular is greased well so that it bakes to a crispy, golden colour. 7. Insert these sheets on top of the baklawa filling layer. 8. Bake the baklawa cheesecake in a 160- 170°C oven for 45 minutes or until an inserted skewer comes out mostly clear. If the baklawa still seems fairly light even when the cheesecake is ready, up the temperature for a few minutes to toast the pastry, then remove from oven. 9. While the cheesecake is baking, prepare the syrup. This is made by heating 2 cups of sugar in 2 cups of water until they come to the boil. Turn off the heat, then add two drops of lemon juice and a dash of orange blossom water. 10. Pour syrup evenly over the baklawa cheesecake while it is still hot out of the oven. Allow it to cool, then refrigerate for a few hours until firm enough to serve. Bon appetit! 1. Using scissors, cut half a packet of shredded Kataifi into little pieces. 2. 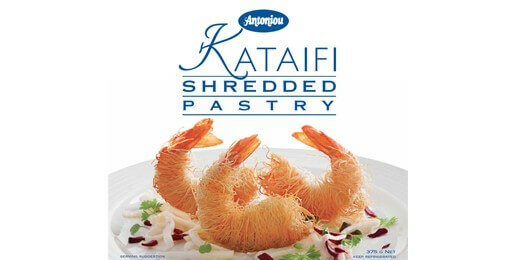 Pour melted butter over the kataifi pieces and make sure that they are completely coated. 3. Layer the kataifi over the cheesecake base, and place into a 160- 170°C oven for 45 minutes or until an inserted skewer comes out mostly clear. 4. While the kunafa cheesecake is baking, prepare the syrup. This is made by heating 2 cups of sugar in 2 cups of water until they come to the boil. Turn off the heat, then add two drops of lemon juice and a dash of orange blossom water. 5. Pour syrup evenly over the kunafa cheesecake while it is still hot out of the oven. Allow it to cool, then refrigerate for a few hours until firm enough to serve. Alternatively: You may wish to exchange the biscuit base in the original cheesecake recipe for a kataifi base. 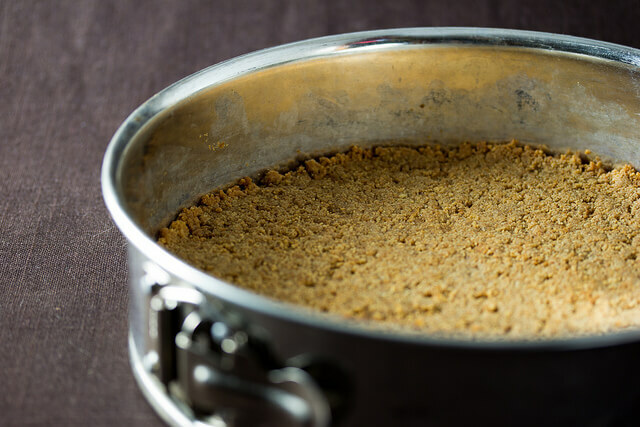 As such, you would again cut the kataifi into little pieces and coat it in butter, pressing it firmly into the spring-form pan before pouring the cheesecake batter over it and then adding a second layer of kataifi to top it off. Cover in syrup while hot and garnish with pistachios. Voila! 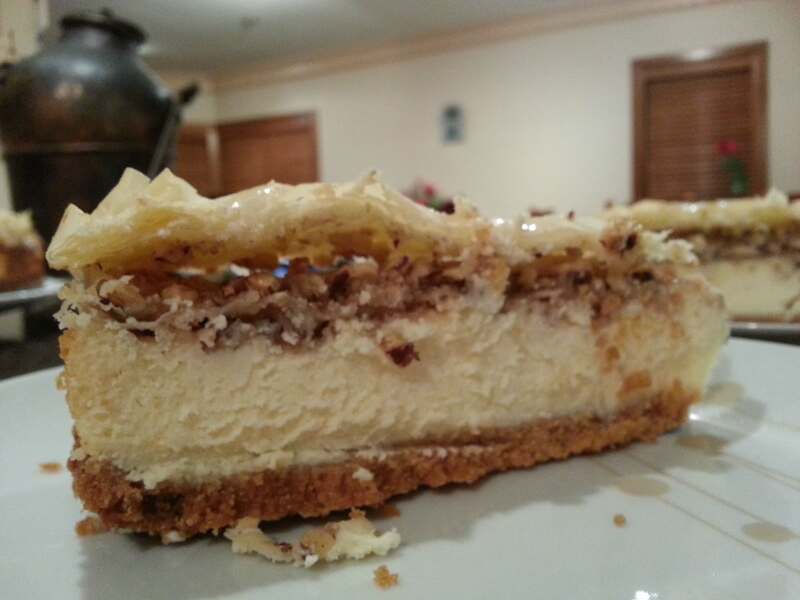 So, Sajjelers, take a chance and dress up your cheesecakes with that extra Mediterranean edge. As long as they’re not counting calories, your guests are bound to love the end product. Bel hana we-shefa; enjoy!